Background: Chronic Myelogenous Leukemia (CML), a cancer of the myeloid lineage, affects around 15 per 100,000 people per year in the UK. Tyrosine Kinase Inhibitor (TKI) oral therapy is used to target the causative BCR-Abl protein. Second-generation TKIs namely dasatinib and nilotinib are understood to be more potent than the first-generation prototype imatinib. However, cost-effectiveness is hindering the widespread use of second-generation TKIs. The patency of these drugs will expire in the immediate future and so, the prices of these are expected to fall. A clear understanding of the efficacy of the potent second-generation TKIs will aid decision-making bodies such as NICE UK to form guidelines on front-line drugs. This review aims to collect and examine evidence from current literature on the effectiveness of second-generation TKIs in the treatment of chronic phase CML. Method: A systematic search of major databases was carried out and the results were screened using specific inclusion and exclusion criteria. Five major randomised controlled trials were identified. Data extraction and risk of bias assessment were carried out using standardised forms developed specifically for RCTs by the Cochrane Collaboration. Quality assessment of the trials was performed using the CASP tool. Results: The five chosen RCTs were the DASISION trial, the S0325 trial and the SPIRIT 2 which compared dasatinib with imatinib, and the ENESTnd trial and the ENESTchina trial which compared nilotinib with imatinib. A participant pool of 2692 patients had a mean age of 61 years and similar features. A total of n=789 and n=697 patients were randomly assigned to dasatinib and nilotinib arms. Second-generation TKIs were associated with greater response rates in patients than imatinib; for example, dasatinib was associated with an odds ratio (OR) of 0.0803 (95%CI 0.0434 to 0.1489 P<0.0001) in the S0325 trial, and nilotinib OR= 0.1772 (95%CI 0.1217 to 0.2581 P<0.0001) in the ENESTnd trial. Conclusion: Current evidence points to a greater efficacy of second-generation TKIs, namely dasatinib and nilotinib, than imatinib. Adverse events (AEs) were reported for all three drugs. Due to the lack of a direct comparison between second-generation TKIs, the effectiveness of dasatinib over nilotinib could not be inferred. In order to aid bodies such as NICE to choose the most apt and safe TKI for use as a first-line treatment choice, it is suggested that future studies aim for a direct comparison. Toxicity data should also be generated to supplement this process. Chronic Myelogenous Leukaemia (CML), a cancer of the myeloid lineage, accounts for 8% of adult leukaemias in the UK (1). This acquired genetic disorder causes the pluripotent myeloid stem cells in the bone marrow to undergo unregulated growth (2). A proliferative advantage thus results in patients having abnormally increased levels of serum leukocytes. The WHO ICD-10 classifies this disease as a malignant neoplasm with ‘Philadelphia positive, t(9:22) (q34:q11) translocation and crisis of blast cells’. With an annual incidence of 14.8 per 100,000 per year (3), leukaemia, along with its subtypes, is the twelfth most common cancer in the UK. The disease has a male predominance and its incidence increases with age (4). Although no causative environmental leukomogens have been identified, several studies have observed higher incidence in patients exposed to very high doses of ionising radiation (5). CML is often triphasic, with an initial chronic phase (CML-CP) followed by the advanced phases of accelerated (intermediate) phase and a final blast crisis- all with deteriorating laboratory profiles and clinical signs. Tyrosine kinase inhibitor (TKI) oral therapy has been used to extend the clinical course (particularly that of CML-CP). CML today is one of the fewest cancers which can be treated to attain 79% survival rates (6). Since the introduction of TKIs, there has been a significant reduction in mortality rates in the UK- from 1.5 per 100,000 in 2000, to 0.6 in 2010 (7); TKI-attributed mortality reduction is however debatable (8). Currently, imatinib is used as first-line treatment and is available to patients in the UK. Approved by the FDA in 2001, imatinib has been shown to be very effective in the treatment of CML. Prognosis is excellent with an increase in 5-year survival rates by 32% since its introduction (9). Hailed as the ‘magic bullet’ against cancer (10), there have been several setbacks since introduction. Firstly, patients soon developed resistance. This was counteracted with the development of second-generation TKIs: nilotinib and dasatinib for imatinib-resistant (or intolerant) patients (2). Secondly, TKIs are deemed as one of the most expensive cancer drugs. For instance, in countries such as India where the generic forms are used, the cost difference for a month course, when compared to that in the UK, is an astonishing £4200 and £620 for imatinib and dasatinib, respectively (11). As a result, the availability of TKIs is strictly regulated by NICE. Whereas NICE recommends nilotinib as a first line drug “if the manufacturer makes Nilotinib available with the discount agreed as part of the patient access scheme (PAS)”, dasatinib is neither a part of PAS nor is it recommended in CML-treatment (12). NICE explicitly comments on the low cost-effectiveness as the major reason for this despite it acknowledging these drugs to be more effective (13). It is to be reminded that NICE uses clinical as well as economic data to form its guidelines. Prices are expected to fall when the patency of TKIs expires in the future. For example, the patency for imatinib will expire in December 2016 in the UK. This may lead to possible alterations in the NICE recommendations and the use of second-generation drugs for first-line treatments may be favoured. Knowledge on the effectiveness of second-generation TKIs will help us shape the choice of appropriate TKIs in the future, when the pharmaceutical industry will be flooded with their generic versions. As such, this review aims to examine current evidence on the effectiveness of second-generation TKIs in the treatment of CML-CP patients. CML is an acquired neoplasm resulting from the formation of an aberrant gene. 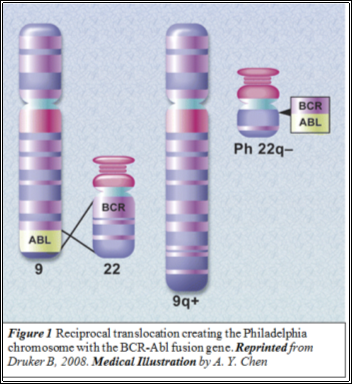 In the myeloid stem cells of patients, the breakpoint cluster region (BCR) on chromosome 22 and the Abelson murine leukaemia (c-Abl) on chromosome 9 undergo a (9;22) translocation (Figure 1) . This results in the formation of the aberrant BCR-Abl fusion gene which is seen in 95% of patients (who are so referred to as Ph+ve). 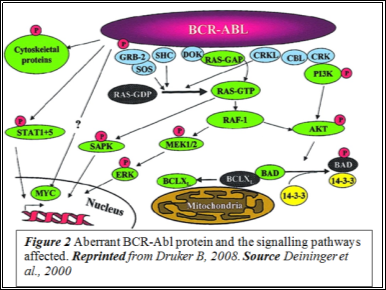 The BCR-Abl gene is translated into the leukemogenic protein p210BCR-Abl, an aberrant tyrosine kinase (TK) enzyme that is capable of constitutive activity. TKIs inhibit these aberrant TKs. c-Abl, the non-aberrant version of the gene, has a kinase domain which houses the ATP-binding pocket, an SH2 upregulating domain and an SH3 inhibitory domain. The kinase is strictly auto-inhibited and shuttles between the nucleus and the cytoplasm. However, the BCR-Abl TK is localised in the cytoplasm and this is implicated in its constitutive TK activity (Figure 2). In the cytoplasm, it undergoes auto-dimerisation which activates the enzyme by triggering structural alteration. c-Abl works by phosphorylating the Grb2 substrate protein. This activates the SoS effector molecule which facilitates the conversion of Ras-GDP to Ras-GTP. This further activates Raf due to which MEK1/2 is phosphorylated. As a result, ERK, a critical regulator of Cyclin D is also activated. ERK induces the synthesis of Cyclin D, which along with cdk4, determines whether the cell cycle is allowed past the G1 Restriction point. Once past this checkpoint, cell cycle cannot be reversed and so, the resultant daughter cells are produced. Cyclin D phosphorylates retinoblastoma (Rb), which in its inactive state is unphosphorylated and attached to E2F (a transcription factor), and releases E2F. This allows the cell to enter into the S phase (14) to begin DNA replication. 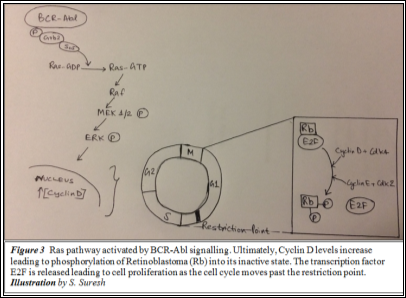 Expression of the BCR-Abl gene upregulates proliferation by constitutively activating the Ras signalling pathway (Figure 3); cyclin D is continuously produced. 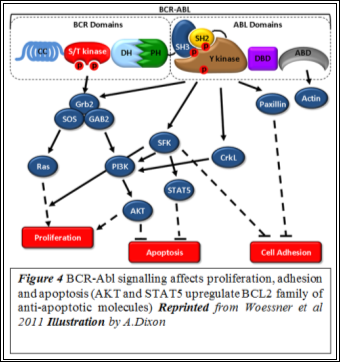 BCR-Abl expression also facilitates anti-apoptosis and disrupts adhesion (Figure 4). A disrupted adhesion to stromal cells and the extracellular matrix reduces the regulatory effect transmitted via focal adhesions (15). Also, clonal expansion is aided by the evasion of apoptosis. Thus, uncontrolled Ras signalling, upregulated anti-apoptosis and disrupted adhesion are understood to lead to the ultimate manifestation of CMLÂ (16). TKIs inhibit these aberrant tyrosine kinases. Imatinib is a competitive antagonist of the tyrosine kinase domain of BCR-Abl (16). Tyrosine kinases exist in active or inactive states, depending on whether the activation loop located on the C-terminal domain is open or closed (Figure 5).In the inactive state, the activation loop is closed and folds towards the ATP-binding pocket (17). 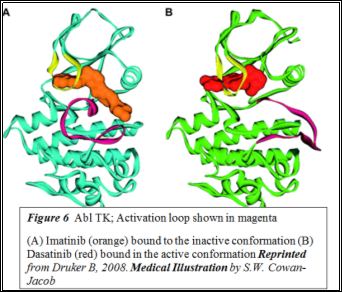 Imatinib and nilotinib bind to the inactive conformation (Figure 6) whereas dasatinib binds to both conformations. Several studies have shown second-generation TKIs to be more effective in treating chronic phase CML (18-20). One such study showed that dasatinib was 325-fold more effective than imatinib at inhibiting BCR-Abl in vitro; this is attributed to its ability to bind to multiple conformations (21). Five randomised controlled trials were identified (Table 9). These included three trials- DASISION, Second Phase S0325 and SPIRIT 2- that compared dasatinib with imatinib and two trials- ENESTnd and ENESTchina- that compared nilotinib with imatinib. All of these together show better outcomes for CML-CP patients treated with second-generation TKIs. The primary end point of all these trials, except DASISION and SPIRIT 2, was MMR rates at 12 months. The DASISION trial looked at CCyR at 12 months. The primary endpoint of SPIRIT 2, the largest dasatinib trial, is event-free survival at 5 years. This will only be measured in March 2018 but nevertheless, secondary outcomes such as CCyR rates at 12 months have been published. All other studies also measured CCyR at 12 months as the secondary outcome. The study aimed to find whether patients given dasatinib had a higher CCyR by 12 months of treatment. CCyR and MMR at 12 months were compared for both drugs and it was concluded that dasatinib may improve long-term outcomes in CML-CP patients due to its shorter response time than imatinib (Table 9; Appendix B: CCyR and MMR measurement methods and scale). Considered as a landmark study, these results proved to be pivotal in accepting dasatinib as a standard second-generation TKI. A 5-year follow-up was conducted to understand whether dasatinib can be continued to be considered as a standard therapy for CML-CP patients. The results (Table 10) supported the original finding (23). The study aimed to compare the response rates for dasatinib- and imatinib-treated patients. Following standard clinical measurement of CCyR rates (Appendix B), dasatinib was found to produce more early short-term cytogenetic and molecular response rates (Table 9). However, the study also noted Grade3-4 toxicities in 58% patients in the dasatinib arm, compared to only 35% in the imatinib arm. Toxicity data were not reported in DASISION or SPIRIT2. CCyR response rates for dasatinib- and imatinib-treated patients were compared. The study observed an increased response rate for dasatinib compared to imatinib (Table 9). With these results, the study concluded that dasatinib was favoured in CML-CP treatment. A multicentre three-arm trial, this aimed to assess the efficacy and safety of nilotinib compared with imatinib. Two groups of patients given different doses of nilotinib were compared to those treated with the standard imatinib dose. CCyR was found to be higher in both nilotinib arms, compared to the imatinib arm (Table 9). The study thus concluded that nilotinib at either doses produced a clinical response better than imatinib. A 5-year follow up (Table 11) aimed to evaluate the long-term outcomes in patients taking nilotinib; MMR and 5-year overall survival (OS) rates of these patients were examined (27). Patients treated with the higher dose of nilotinib were found to have more AEs. Despite this, due to the short-time with which MMR and CCyR were achieved, the study concluded to recommend nilotinib at 300mg twice daily over imatinib. Current evidence provided by DASISION trial and the works of Quintas-Cardama A et al., 2009 and Hochhaus et al., 2009 were referred by the researchers. These directly link shorter response time with increased long-term benefits and reduced risk of progression (28, 29). The trial, conducted in Chinese patients, aimed to observe MMR rates at 12 months in nilotinib and imatinib treated patients. Also, conclusions on whether genetic and ethnic factors affect response to treatment were drawn using the results. The pooled data from 2692 patients show that the second-generation TKIs were more effective than the first-generation TKI imatinib. The results from the three RCTs which compare dasatinib with imatinib give an average absolute risk reduction (ARR) of 26.0%; for nilotinib, average ARR is 24.6% (Table 12). Together, second-generation TKIs produce a very promising complete cytogenic response in 253 per 1000 patients per year. As a comparison, a Cochrane systematic review conducted by Aguilar MI et al., 2005 to understand the efficacy of oral anticoagulants in preventing ischemic heart attacks, collected data from five RCTs with a pool of 2313 patients. This showed that warfarin gives an ARR of 4.05% and so the use of warfarin as a common anticoagulant was continued to be supported (33). Hence, a very high combined ARR of 25.3% shown in this review emphasises the potency of second-generation TKIs in treating CML-CP. With continuous treatment using these TKIs, remission can be attained. The DASISION trial was industry-sponsored and as such, the results are to be approached with caution due to a possible risk of bias. However, the largest dasatinib trial, SPIRIT 2 also shows a very similar ARR of 11.8%. Moreover, the European LeukemiaNet Panel used the results from the DASISION and other similar studies to set the 2013 guidelines in the management of CML-CP (34). Hence, the results are widely acknowledged by the scientific community. However, due importance must be given to toxicity data generated from these studies whilst interpreting the results. Whilst DASISION stated that adverse events (AEs) for both arms were similar, toxicity data were not explicitly reported in DASISION and SPIRIT 2 studies. The S0325 trial addressed this issue (See Results). The team suggested that the choice of TKI should only be made based on a patient’s individualised ‘risk of progression, pre-existing comorbidity and compliance‘ (24). With reference to this, the 5-year follow-up of DASISION emphasised that there were no new events reported outside of the initial 12 month period (23). Nonetheless, both teams reiterated the quick response of dasatinib in treating CML-CP as an indication of its greater efficacy. However, this increased effectiveness becomes equalised in the long-term, with both dasatinib and imatinib producing similar overall survival rates five years post-treatment (23). Compared to dasatinib, the risk of AEs was only slightly increased in nilotinib patients. Unlike the other RCTs, ENESTnd trial observed imatinib-treated patients to have a high risk of AEs. Nausea and diarrhoea were reported in a very high percentage of patients- 41.1% and 46.1% respectively. The molecular mechanisms of AEs are not currently understood and no studies have been trialled in patients to quantify and assess TKI-related AEs. Hence, a clinically-relevant conclusion was not drawn from these results. One main factor limiting this review is the absence of direct comparative studies between dasatinib and nilotinib. The S0325 trials observed that the standard dose of dasatinib produced more AEs than imatinib and the ENESTnd trial showed that the higher dose of nilotinib produced more AEs than imatinib. However, these observations alone cannot be used to highlight nilotinib over dasatinib. Another limitation is the possibility of selection bias. Currently, numerous on-going clinical trials worldwide aim to compare the various TKIs. However, much data is yet unpublished. These could not be included in this review due to the lack of an appropriate critical appraisal tool, other than the CASP tool used in this review, with more rigorous criteria. Despite these, conclusions drawn from a large pooled study population of 2692 patients remain reliable. Nonetheless, inconsistencies on both efficacy and AEs data were present when comparing the five trials. The ENESTchina trial observed a better result with imatinib at twelve months than nilotinib (OR= 1.1871; 95%CI 0.6578 to 2.1426 P=0.5691). Additionally, the ENESTnd trial reported imatinib to be associated with higher AEs than dasatinib. However, the pooled data show a greater efficacy of dasatinib and nilotinib than imatinib. Dasatinib is also associated with more AEs than standard dose nilotinib and imatinib. "Effectiveness of Second Generation Tyrosine Kinase Inhibitor." UKEssays.com. 11 2018. All Answers Ltd. 04 2019 <https://www.ukessays.com/essays/sciences/effectiveness-generation-tyrosine-kinase-5395.php?vref=1>. "Effectiveness of Second Generation Tyrosine Kinase Inhibitor." All Answers Ltd. ukessays.com, November 2018. Web. 20 April 2019. <https://www.ukessays.com/essays/sciences/effectiveness-generation-tyrosine-kinase-5395.php?vref=1>. UKEssays. November 2018. Effectiveness of Second Generation Tyrosine Kinase Inhibitor. [online]. Available from: https://www.ukessays.com/essays/sciences/effectiveness-generation-tyrosine-kinase-5395.php?vref=1 [Accessed 20 April 2019]. UKEssays. Effectiveness of Second Generation Tyrosine Kinase Inhibitor [Internet]. November 2018. [Accessed 20 April 2019]; Available from: https://www.ukessays.com/essays/sciences/effectiveness-generation-tyrosine-kinase-5395.php?vref=1.